In 1885 a group of Finnish-born settlers from Northern Michigan crossed into Canada at Sault Ste. Marie and walked the 180 miles to Copper Cliff. This group included Eerik Erikson, Tuomas Jacobson, Eerik Karppi, Jaakob Kari, Juho Lauttamus, Matti Makela and Jacob Ollila. 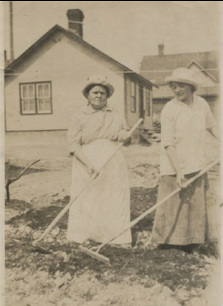 Early Finnish workers in Copper Cliff settled in an area known as Shantytown. An area roughly bordered by the Copper Cliff Dairy building, the Museum and Succo Street. 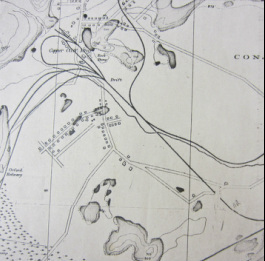 In 1886 rents on leased land in both the Copper Cliff settlement and Shantytown were a modest twenty-five cents a month. Leases forbade the sale of liquor and gave the company the right to approve the purchaser when privately owned buildings were sold. In the 1891 Census of McKim and McKim and Chisholm Townships, groups of Finnish people were boarding at half a dozen main houses run by Mary and Samuel Harju, Mary and Reuben McEwan (Scottish origin), Thomas Jacobson, John Harikson, and others. Other migrants in Shantytown were Polish, Ukrainian and French Canadian. Residences and businesses were established, along with St. Timothy’s (Wuoristo) Lutheran Church, the Temperance Society, the Finland Hall, the Finnish Presbyterian Mission (Franssi’s Church) and St. Nicholas Greek Catholic Church (also known as the ‘Polish’ Church). See Places – Johnson Extension for additional information on the Ukrainian community. People involved in the temperance movement wanted to eliminate excessive consumption of alcohol, which they viewed as the source of societal ills and misery. The Temperance Society was formed on November 18, 1894 with 27 members. 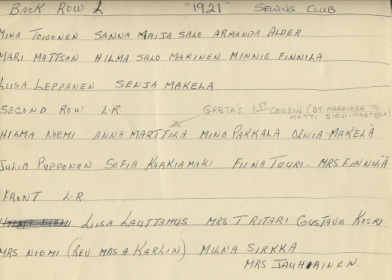 Signatures on the Charter included Kustaa Linja, Kustaa Maki, Matti Makela, Matti Ollila, Herman Koski, Isaac Harju, Miina Ojala, Jacob Iriiman, Erick Erickson, Miina Lauttanu and Amalia Linja. A hall was built in 1895 at 44 Balsam Street. Opposition to the Society existed. The Wuoristo church used the hall until 1907 (when the church was built). The Temperance Society dissolved in 1914 and the hall was sold, to be used as a private residence. The founding meeting of St. Timothy’s congregation was held on September 12, 1897. The congregational committee was chaired by Herman Koski. 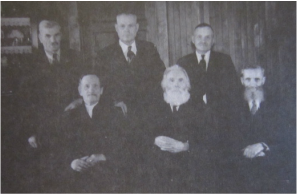 Photo April 1938 when six founding members of the church met at the home of Elias Kallio. 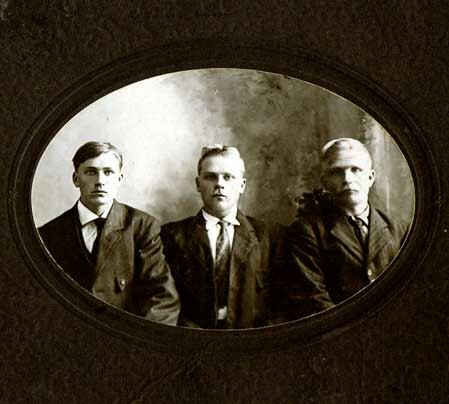 Standing (L to R) John K. Hauta-aho (later known as Wilson), Herman Koski, Heikki Makinen, Sitting (L to R) Elias Kallio, John Lahti, Tuomas Jacobson. The Church is probably one of the oldest original church buildings in the region. It was built in 1907 – 1908 at 12 Poplar Street (now Collins Drive). Finnish confirmation class 1914. Portrait of Ontario's Peoples, Multicultural Canada. 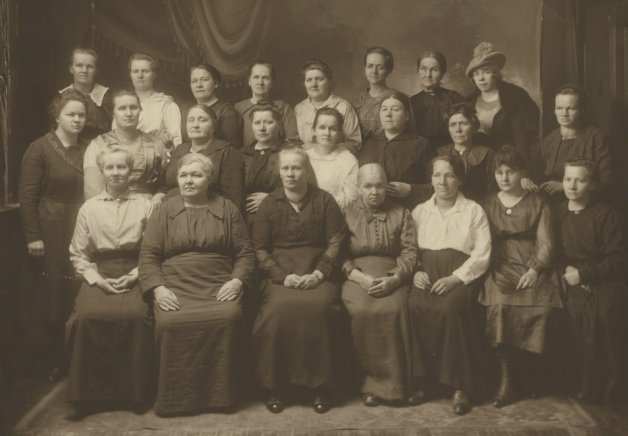 Finnish Church Ladies Sewing Club, Copper Cliff 1921. Photo Private Collection Ed Koski. Members of the Sewing Club. Photo Private Collection Ed Koski. Herman Koski was born October 14, 1868 in Nurmo, Finland. His wife Kreeta Kustaava Ventela was born October 7, 1869 in Jalasjarvi, Finland. They were married June 4, 1892 in Copper Cliff. In addition to chairing the original Wuoristo congregational committee and being a member of the Temperance Society, Herman Koski was also an early church organist. Visiting pastors boarded at the Koski home. 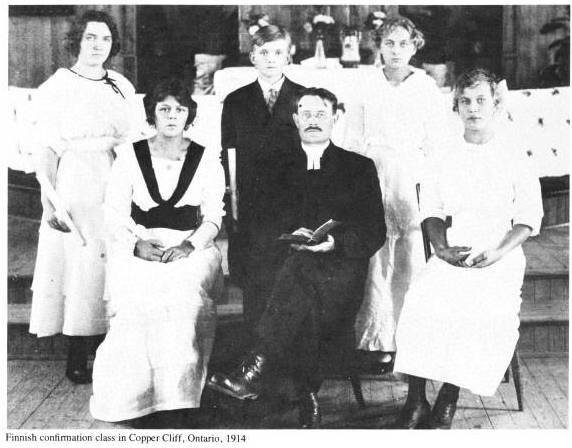 Herman’s wife Greeta, established the Copper Cliff Ladies Aid in 1897, along with Pastor Hoikka. 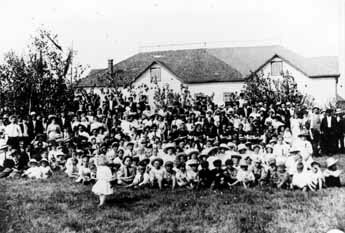 The group was involved in fundraising for the church, and Red Cross activities during the wars. From the 1901 Census of Copper Cliff, Herman Koski, age 32, his wife ‘Gustave’, age 31, their son Johan Emil, age 7, daughters Helmi Maria, age 6, Linnea Lina, age 1 month, all born in Ontario. Herbert Arvo was born January 27, 1903. He was a barber and married Ilmi Elizabeth Harju. Herbert died March 18, 1932 at age 28 of pneumonia. Onni Villiam (Bill) born January 2, 1905 at 65 Balsam Street, he married Aune Tuulikki Suomalainen July 30, 1938 in Copper Cliff. Maria Mary Gustava born February 23, 1907 in Copper Cliff, married Arthur Joseph Morin. Mary died January 27, 1931 at age 23. A daughter Lylla Mary Koski died February 2, 1908, shortly after birth. Aili Irene Elizabeth was born July 1, 1910 in Copper Cliff, married Jack O'Hara July 6, 1936 in Windsor. Aili was involved with the Church. In 1911, Herman Koski’s General Store was at 266 Balsam Street, with his house at 264 Balsam Street. From the 1911 Census of Copper Cliff, Herman Koski, age 43, his wife Gustavi, age 42, and their children Helmi, age 17, John, age 18, Linne, age 10, Herman, age 8, William, age 6, Mary, age 5, and Aili, age 1. By 1914 Herman Koski owned Hermand Koski’s Billiards, Barber Shop and Apartments at 4 Temperance Street. The family was living at 65 Balsam Street. In 1920 Herman Koski, labourer was living at 65 Balsam Street with Lina. John Koski was living at 13 Finland Street and worked for International Nickel. 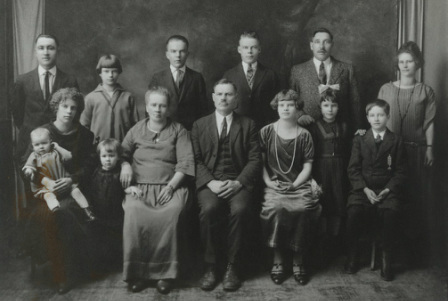 Greta and Herman Koski and Family, Copper Cliff 1925. Photo Private Collection Ed Koski. Herman Koski Driver's License 1914. Photo Private Collection Ed Koski. Herman Koski, Copper Cliff 1938. Photo Private Collection Ed Koski. 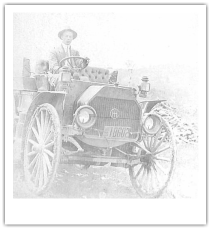 Koski Family car, 1911 International Harvester Model A. Photo Private Collection Ed Koski. Aline Koski Identification Card 1940. Photo Private Collection Ed Koski. 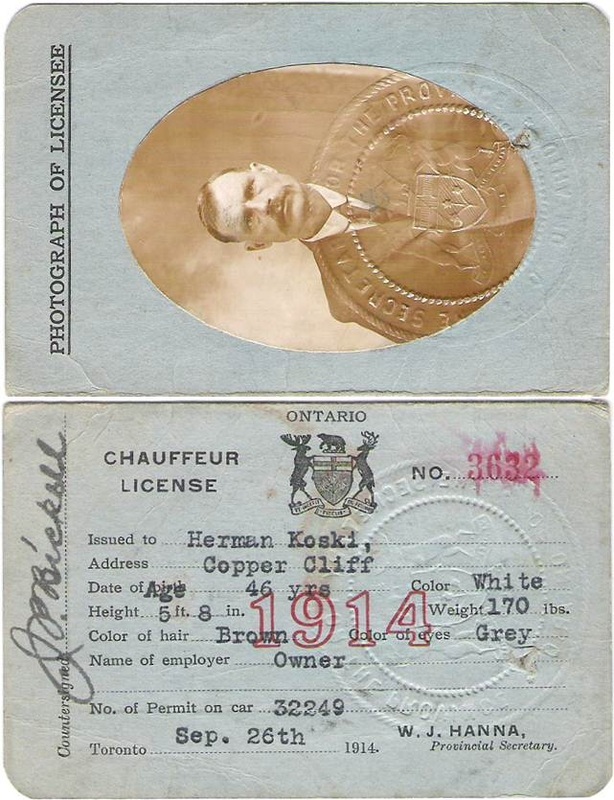 Employment card for Herman Koski from The Canadian Copper Co. Photo Private Collection Ed Koski. John Ristimaki family in front of their home on Succo Street. City of Greater Sudbury Heritage Museums Collection. Children in the photo are August Martin, born 1900; Niilo John, born 1903 and Charles G., born 1904, all born in Copper Cliff. Thank you to Ed Koski and Bill Makinen for their identification of the children. John R. McKinnon’s General Store at 292 Poplar in 1911, house at 250 Balsam Street; this became the Henry McKinnon General Store at 6a Poplar by 1914, house at 4 Poplar Street till after 1920. Open the following files to read the O'Flynn Grocery Price List for February 1914. By 1930 Herbert Johnson was living at 4 Poplar Street and running a Grocery Store at 6 Poplar Street. Werner Koivula lived at 293 Poplar Street in 1911, and at 5 Poplar by 1914. He was a Baker. From the 1911 Census of 293 Poplar Street, Copper Cliff, Verna Koivula, age 27, emigrated in 1905, Occupation Baker in his own shop, his wife Ina, age 30, emigrated in 1896, step-daughters Helen, age 12, and Orene, age 9, step-son Wilfred, age 6, and sons Leonard, age 3, William 2 months and boarder Abraham Salo, age 23, emigrated in 1906 from Finland, Occupation Trammer. Henry Makinen's General Store was at 322 Poplar Street in 1911. 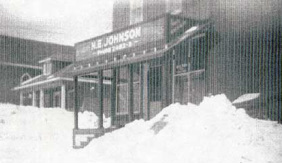 In 1914 this was the Herbert ‘Herbie’ E. Johnson General Store at 3 Poplar Street. By 1920 this was a branch store of Hennesy and Racicot. Johan Henrik [Henry] Makinen was born April 30, 1871 in Finland. He married Roosa Maria Kuopio, born October 29, 1865 in Keski-Suomi, Finland. Three daughters were born in Saarijarvi, Finland Impi Marie, born March 7, 1892, Anna, born January 4, 1894 and Martta, born April 20, 1896. Henry and his family emigrated in 1896. Two daughters and two sons were born in Copper Cliff, Katri, born August 2, 1900, Aili, born March 10, 1902, Johan, born June 7, 1903 and Victor Veikko, born April 19, 1907. In the 1901 Census of Copper Cliff, McKim, Henry Makinen’s occupation was listed as miner. The family had a domestic servant and nine lodgers. From the 1911 Census, Henry and his family lived at 232 Poplar Street. His occupation was ‘General Store’. Living with them were a domestic servant Maud Martilla and six boarders, all labourers born in Finland. Herbert Emil Johnson was born March 28, 1891 in Nurmo Finland. He married Impi Marie Makinen in Copper Cliff. Impi was the daughter of Henry Makinen. Herbert took over the store from his father-in-law. For information on Jacob Walli’s Rooming House at 272 Poplar Street (corner of Balsam Street) and Matti Martilla's Boarding House 2 Poplar Street See Places - Boarding Houses and Clubhouses – Other Clubs. Ida Susanna, born in 1902. Ossian Edward Walli, born in Copper Cliff December 26, 1903. He was inducted into the Canadian Mining Hall of Fame in 1993. Ossian was principal at the Haileybury School of Mines for 22 years. He administered its operations and taught mathematics and mineral chemistry classes. He built a reputation for the school that is recognized in mining communities around the world for graduates well versed in all disciplines related to mining. Jacob Walli, born in 1905, died within a year of convulsions. Emil John Walli was born in 1907. Jacob Walli died at age 38 of diabetes on January 26, 1917. Ossian Edward Walli. Canadian Mining Hall of Fame. 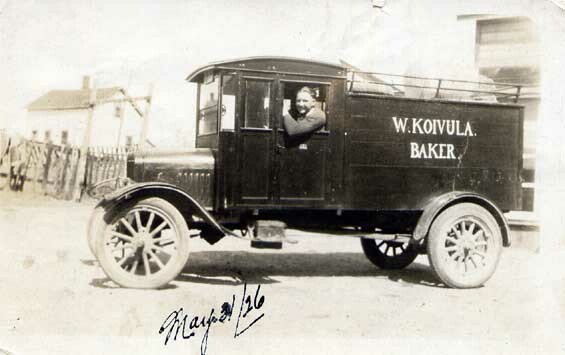 Koivula Bakery 1903 Copper Cliff. City of Greater Sudbury Heritage Museums Collection. In 1911 Mrs. Kate Yankoski, operated a General Store at 273 Balsam Street. By 1916 the address was changed to 39 Balsam Street. Katherine Samulski married Stanislaus (Stephen) Yankoski, Polish immigrants. Their children were Joseph Alexander (Steve) b. February 10, 1898 (a soldier in World War I and a well-known hockey player); Mary, b. 1900, Stephen b. February 10, 1901 and died January 2, 1907; Martha Annie b. July 21, 1903; Walter b. May 29, 1907; Albert Daniel b. April 21, 1909 and died November 7, 1909 of tubercular peritonitis. By the 1911 census, Katherine was a widow. She later married Wagner and moved to Sudbury. Several independents sold milk door to door in Copper Cliff. These individuals included Henry Nelson, father of John Nelson, Ernest J. Kallio, John Salo, Kenttala, Matti Harju, and John Lahti, all from Waters Twp. John Salo started a dairy in Copper Cliff in 1910. This original dairy was on Serpentine Street. John Salo sold out to E. J. Kallio. In August of 1910 D. Blue and the Copper Cliff Dairy assured the people that they would maintain the price of bread and milk in spite of the threatened inflation. 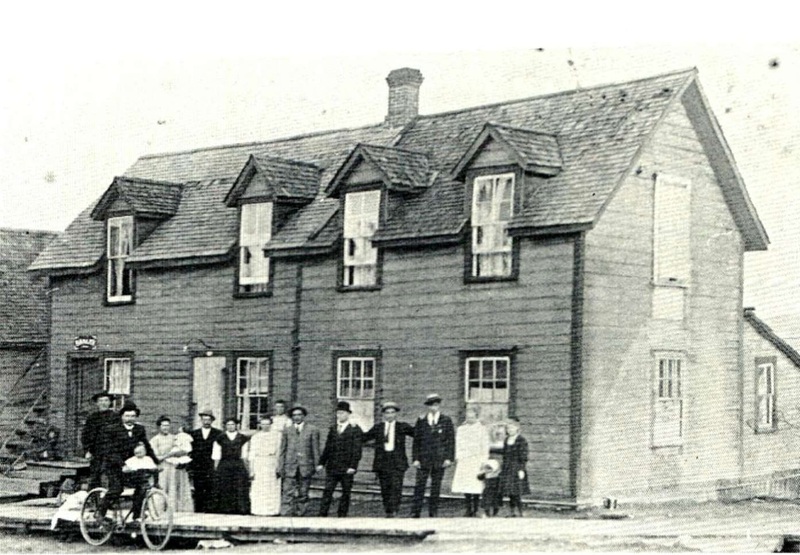 A dairy in Copper Cliff was operated by Thomas and Moses Gatchell in 1911. 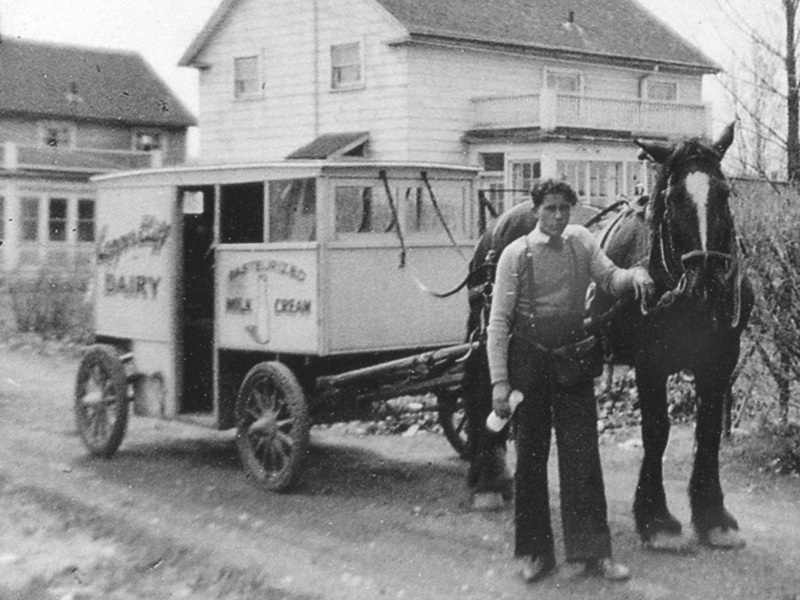 In June 1914, the Sudbury and Copper Cliff Dairy began operating an ice-cream plant. In September of 1914, the Sudbury and Copper Cliff Dairy raised the price of milk from 10 to 12 cents a quart. In 1915 a new milk bylaw went into effect at Copper Cliff “no adulterants would be tolerated” (presumably chalk). 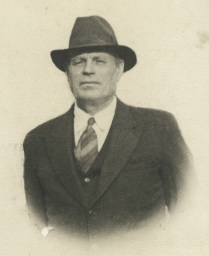 Ernst Johannes Kallio started the Copper Cliff Dairy in 1924. He was born September 20, 1893 in Hiitola, Finland. In 1930, the Dairy was at 5 Temperance Street, John Nelson was manager. Managers of the Copper Cliff Dairy included John Salo, Henry Nelson, Elias Kallio, John Harju, Ernst Kallio, and Bill Johnson. Copper Cliff Dairy 5 Temperance Street, 1927. Three girls in front of the dairy were Sylvi Pupponen, Gertie Kupias and Aune Seppala. Photo Private Collection Marlene and Marty Neva. Copper Cliff Dairy ticket circa 1930. Photo Private Collection Ray Prevost. 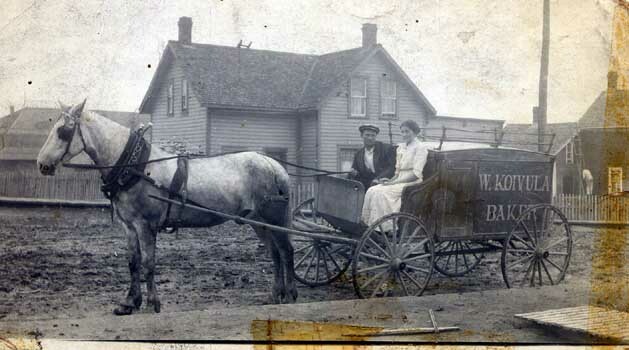 Nathan Clifford Uttley and Copper Cliff Dairy delivery wagon. Photo Private Collection Marlene and Marty Neva. 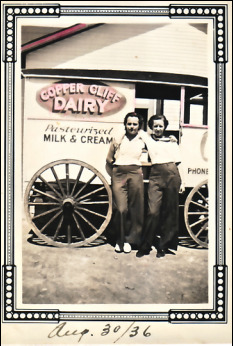 Copper Cliff Dairy wagon, L. Aune Uttley (nee Seppala) and R. Aini Eklund (nee Lampi). Photo Private Collection Marlene and Marty Neva. William 'Bill' Stinson from The Sudbury Star August 26, 1972. Contributed by Marty Neva. The Youth Society was founded on February 15, 1903. 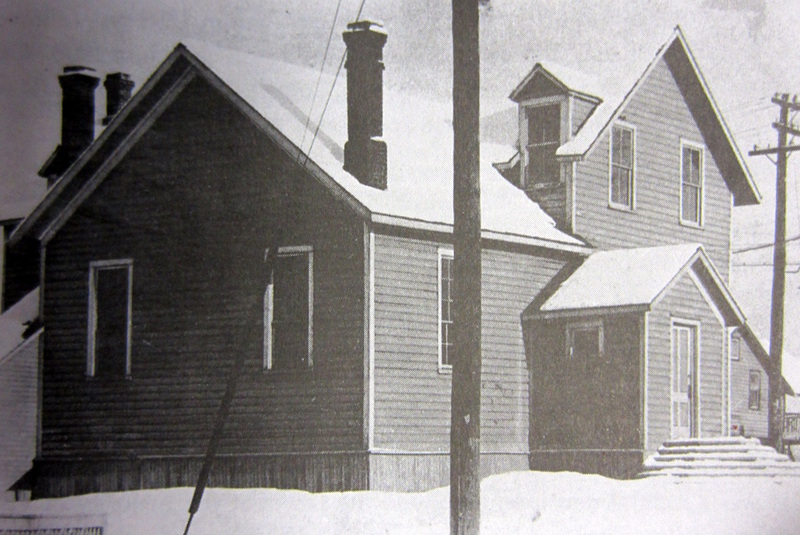 The Finland Hall, owned by the Young People’s Society of Copper Cliff was located at 353 Temperance Street. The youth organization worked closely with the church and provided many activities such as gymnastics, sports, theatre and choir. The hall was a centre of social and cultural activity in the community. In November of 1903, The Engineers’ Club gave a dance in the Finland Hall which was well patronized. February 1909 Charles LaRush, of Montreal, boxed S. C. Fields, of Sudbury, in the Finland Hall. For four rounds it was even-Stephen. In the fifth, Fields caught his opponent with a left swing, followed by a hard jab to the stomach. LaRush rested quietly while the referee counted up to 10. May 1913, the Copper Cliff Football Club put on a concert in Finland Hall. Ed Knight sang I’d Love to Be in Loveland. Art Death and Fred Dubery put on a comic cross-talk. I. Smiles and A. Sith, a duet called ‘Excelsior’. A song sketch, ‘Gypsy Anne’ was presented by Mesrs. A. H. Trestrail, Roger Stewart and Mrs. Trestrail. A. Shute sang four songs. G. Burns, as Captain Ginger, had the house rocking. A sketch called ‘Motoring’ wound up the event. In it, W. Alexander, A. Death, F. Dubery, R. Bryson, G. Burns and R. Charles, had the house screeching for 30 minutes. Miss Purdy and Len Cross assisted at the piano. Masquerades were in favour back in February 1914. One of the most successful was held in Finland Hall under the auspices of the Mysterious Thirteen Club. Among the smartest costumes in the ballroom were those worn by Mrs. J. C. Brackett, Mrs. Frank Taylor, Mrs. W. Kent, Irene and Pearl Lawson, and Mr. and Mrs. James Cummings. In May of 1914, led by Drum Major Tod Lee, under the direction of John Gribble, the Copper Cliff Band paraded about town before going to the Finland Hall, to present its first concert of the season. A rift formed between Young People’s Society members. 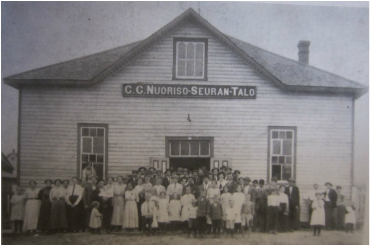 In December of 1914, the socialists of Copper Cliff were headed by C. C. Young and the Peoples’ Society was given possession of Finland Hall after a long legal battle. The original society was headed by Herman Vick (not a socialist) and a vote was taken for officers. Chariman, John Wurta, vice-chairman Auti Tainio, directors, Sam Luhtanen, John Walli, Hugo Pernu and Tom Tuvai, amusement committee John Lusa, Auti Tainio, John Koski, Mary Sala, Alex Sala, Yacob Kabisti, Henry Ellman, Orvi Korpinen, Yako Makalo, Sam Luhtanen, Henry Elman and John Koski. At a Copper Cliff council meeting on January 1, 1915, a petition was presented, signed by 59 Finlanders, asking the town to do something to provide work for them during the winter. The council asked for further information as to how many of the men were married and whether they were genuine residents of Copper Cliff. The relief committee issued invitations for a charity ball to be held in Finland Hall on January 19, 1915. The Rex Orchestra was hired to furnish the music. K. L. Newton was secretary for the occasion. In March 1915 the hall was destroyed by fire. Rumor was that it was a case of arson, but no charges were ever laid. A new hall was build in the East Smelter settlement. See Places - East Smelter and Johnson Extension. In 1913 Rev. Arvi Heinonen, an anti-socialist, established the Copper Cliff Presbyterian Mission (Finnish) as a company-sanctioned church. It was located at the present site of the Copper Cliff Dairy building. It was called ‘Franssi’s Church’, a reference to supporter Tuomas A. Franssi, a local merchant. The ground floor was used as a church and the second floor for social and educational purposes. Read more ‘Between a Rock and a Hard Place: A Historical Geography of the Finns in the Sudbury Area by Oiva W. Saarinen’. In 1913 Copper Cliff was the largest Finnish settlement in the Dominion of Canada. Thomas Franssi was born October 25, 1880 in Finland. He married Sofia Kannisto who was born at Ylistaro, Lansi-Suomen Laani, Finland in February of 1883. Aili Maria (Mary) Franssi, born 1905. She married Eino Wilhelm (Pinky) Wilson, son of John Wilson and Susan Jarvi at Copper Cliff on June 29, 1926. Yakob Yalusi ‘Jacob’ Franssi was born November 12, 1907. In 1914 Thomas Franssi had a General Store at 61 Balsam Street. By 1930 he had branched out to sell groceries, dry goods, boots and shoes. His son Jack J. Franssi, married to Lilian, took over the store by 1936; groceries, dry goods, boots, shoes, clothing. Sister Ellen was a clerk at J. J. Franssi. 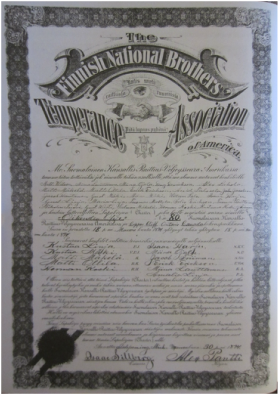 From 1926 to 1931 Thomas Franssi was appointed as Finnish Vice-consul at Copper Cliff. File Archives Canada. The first Ukrainian church location was “St. Nicholas Ruthenian Greek Catholic Church,” built during 1908-09 at 52 Poplar Street. In 1900 Ukrainians (Ruthenians) worshipped in St. Stanislaus Kostka Church in Copper Cliff. The first child of Ruthenian roots baptized in Copper Cliff was John Ostrowski son of Ivan and Paraska (Burnatz) on February 22, 1902 at St. Stanislaus. Because of differences in observance from their Eastern rite, they were unhappy with the situation. As their numbers increased, Bishop D.J. Scollard took action to have a Ukrainian church built. Ivan Shlemkevych headed the committee, while Andril Ostrowsky, D. Halushchak and A. Ostapovych served on the first church executive. By 1909 a wooden frame church and presbytery was built for Ukrainians on Poplar Street, St. Nicholas. The church consisted of a single rectangular room with half a dozen pews on either side of a center aisle. The altar occupied a small partition, which extended past the rear wall and was covered with a gable roof. Situated at the entrance of the church was a bell tower capped with a copper-covered cupola and a large cross on top. Parishioners were expected to donate 50 cents a month for the upkeep of the church. Father Timothy Wasylevych was the first parish priest (1909 to 1912). Father Carl Yeremia (1912 to 1913) was followed by Father Basil Gegeychuk (1914 to 1918). From the book ‘1909 to 2009 Centenary of the Ukrainian Catholic Church in Greater Sudbury’. In 1920 fire destroyed the interior and the records at St. Nicholas Ukrainian Church. 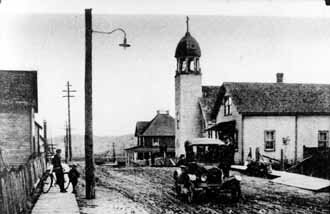 The church was sold and demolished in 1928. Slobodian – Muraska Wedding September 9, 1924, St. Nicholas Greek Catholic Church. From the book ‘1909 to 2009 Centenary of the Ukrainian Catholic Church in Greater Sudbury’. 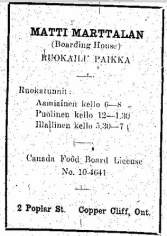 Pakkala’s General Store and Sauna was located at 349 Finland Street in 1911 and at 7 Finland Street from 1914 to about 1932. Antti "Andrew "Andy" Pakkala was born on April 15, 1871 in Kauhava Finland. His wife Wilhelmina "Mina" Ojanpera was born November 28, 1870 in Lappajarvi Finland. Their daughters Fanni (Fanny) Maria , Maud and Anna were born in Kauhava Finland. 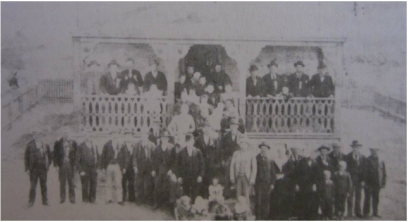 The family emigrated to Copper Cliff in 1903 . On December 16, 1910, Fanny Maria, age 16 married Arvo Yrjo Ilmari Pelkola (Ylipelkonen). Fanny, her husband and parents ran the general store and sauna. From the 1911 Census of 349 Finland Street, Copper Cliff, Andrew Pakkala, age 39, his wife Minnie, age 39, children Maud, age 15, Anna, age 12, Hilma, age 7, Alex, age 4, daughter Fannie Pelkola, age 17, born March 23, 1894, 3 lodgers all born in Finland, Kilda Kalela, age 20, dressmaker, Hilda Jarvi, age 19, dressmaker, and Arvo Pelkola, age 24, drill runner (and son-in-law). In 1911 Franz Carl "Frank" Chirkoski and his family lived at 233 Rushtown (between Finland Street and Evans Road). Franz Carl Chirkoski, labourer, was born January 28, 1867 in Pruszcz Gdanski, Pomorskie, Poland. He married Marie "Mary" Switczkowski. They emigrated in 1890 with their two eldest children. Frank and Mary's children were Martha, Franz "Frank" born in 1888, Paul born in 1891, Victor born in 1892, Agnes born in 1895, she died in 1906 at age 11 of typhoid fever. Alexander Herrick was born in 1896, Rosalie "Rose" born in 1898, Anna born in 1900, Veronica born in 1902, Clara Mary born in 1903 and Charles Stephen born in 1906. Charles died in 1907 at 2 months of age due to bronco pneumonia.